Though my deadline was weeks away I began brainstorming and dreamt up the perfect recipe: One scoop each of chocolate and vanilla ice cream from a local dairy in the Midwest, sliced bananas, chocolate syrup, homemade caramel sauce, fresh whipped cream and crushed salted peanuts. This combination, I thought, hit on salty and sweet and was altogether satisfying. I’m here to tell you my friends, it was. Wanting to include an aspect that was unique, homemade and of course, simple, I decided on making caramel from scratch. If you’ve never made caramel from scratch it’s incredibly easy. This recipe (shared on Cup of Jo as well) requires just four ingredients and 15 minutes of your time and the result is a sinfully delicious and decadent bourbon caramel sauce that is perfect for topping sundaes, cookies, cakes, pies, crisps and everything in between. Find the recipe below and then check back on Saturday for another recipe using this tantalizingly simple recipe in another fantastic dessert setting. Trust us – you don’t want to miss it. 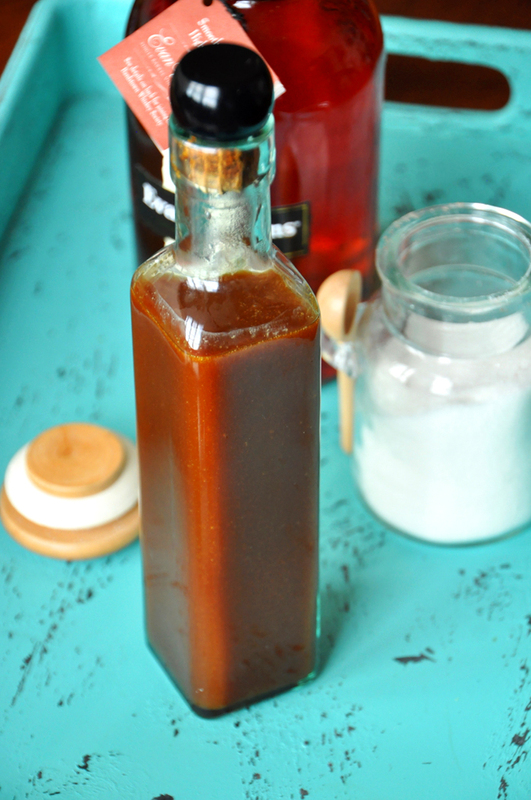 A dreamy 4-ingredient bourbon caramel sauce that makes the perfect addition to sundaes, crisps, cookies, cakes and more. Simmer sugar and water on medium heat, swirling pan NOT stirring for about 15 minutes or until a deep amber color is reached. Watch closely as not to let it burn. Add pinch of salt and bourbon and place back on still-warm burner for another minute while stirring. Transfer to a heat-safe dish or bottle and let cool. Store covered in the refrigerator and bring to room temp or heat in a warm water bath before serving. You can also just simply microwave the jar for 30 seconds before each use without affecting the texture or flavor. *We used Evan Williams Kentucky Bourbon Whiskey, but use whatever high-quality bourbon you have. My dad gave me a huge cinnamon coffee cake on Christmas Eve. 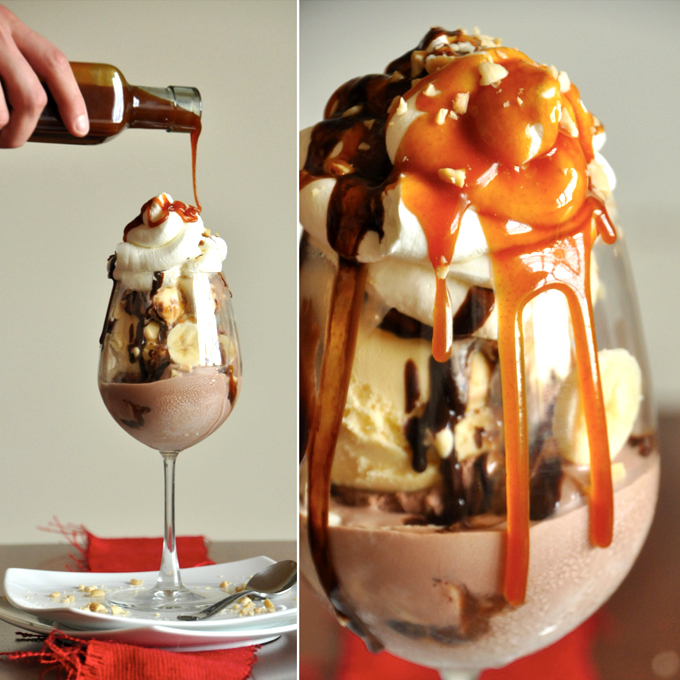 So instead of baking the dessert I originally planned, I googled bourbon caramel sauce and found this recipe. I was drawn to it because of the short ingredient list and it didn’t look too complex. I followed the recipe exactly. The sugar/water mixture took longer than I thought it would but the finished result was delicious beyond my expectations. I served the cake with the caramel and freshly whipped cream with homemade candied pecans. Everyone loved it. I’ll use this recipe over and over and find all kinds of new uses for it. The only thing I might change is adding a bit more salt, but it’s delicious anyway. Thanks for sharing such an easy yet impressive recipe that really elevated Christmas dessert. Great recipe!! I added toasted walnuts and used it over pumpkin raviolis, topped with whipped cream, garnish with a ginger snap! Outstanding! I made this with coconut cream and without the bourbon but it’s amazing! Thank you. Glad to hear that, Frieda! Did you just scoop out the solid cream part and use or the entire can? I used a 1/2 cup as that’s what you need. The cans by me are 400g so too much to use. Easy and awesome! Next time I make this, I’ll use it to make Banana’s Foster. This morning, I made pancakes, a side of cooked ripe peaches and drizzled the sauce over the peaches. Emeril Lagassi would be proud! Stored the rest in a jar for ice cream later tonight. Thank you!! Yum! We are glad you enjoyed it, Karen! Have you ever tried to veganize this sauce. I just pinned your Vegan cheesecake recipe and would love to be able to do the bourbon caramel flavor too! This sounds amazing! Was just wondering, since it has done alcohol, do you suppose it will stay alright without refrigeration for a couple of days in about 30 C /85 F type weather? I know it’s a pesky specific question, but just relying my luck to see if you’ll have an idea :) thank you! Yes that should be fine, Noni! Hi! Wondering if this is safe for children to eat? Not sure if the alcohol burns off and just leaves the bourbon flavor. Was asked to make this for a birthday cake filling, and just want to make sure it is safe for children, and if not, how could I make it kid safe while still having the bourbon flavor? Late update: Though my caramel was grainy from the Swerve, it worked beautifully in the chocolate caramel almond butter cups. They were divine and it added a very slight crunch, like a Reese’s cup, but better! I tried another blogger’s caramel sauce recently and was very disappointed. This one is great! I tried making this with Swerve sweetener because I’m diabetic. The taste is good but mine also crystallized. I still made the recipe, they’re in the freezer, they will still be pretty good, I’m guessing. I have leftover caramel sweetener, I’m thinking this might be good in a baked item, like brownies. I made this to accompany the vegan cheesecake bites. I’m not sure what happened, but it never thickened. I doubled the simmer time, added coconut heavy cream, let it cool before I put in the fridge and still was left with caramel “water.” Any ideas? BTW I love your recipes. They are my go to for every holiday! Hmm, know that coconut cream doesn’t quite thicken as much as real cream. However next time, try reducing the water by half – that should help! Hi there! I made this recipe last night, with my own dairy free tweaks… so the coconut cream definitely works well, and I agree with Dana that you should halve the water. It makes it much more watery with the coconut, and it gets really soupy. And I also ran into the problem of the amber color disappearing when the coconut cream was added. To solve that, I ended up adding about a half of cup of coconut sugar, and voila! it was perfectly golden brown. Its definitely not as thick as normal caramel but it holds up really well after being refrigerated. Not too stiff, not too thin. Hope this helps! Hi there! Nope, I just usually scan my local grocery store or World Market. I made this tonight to go with brownies for a pot luck tomorrow. I made two batches: one with bourbon, the other with Bailey’s. I’m not sure which I like better! The first batch did seize up and solidify some when I added the cream. I removed the lumps and the rest is holding up fine. On the second batch I used a whisk instead of a spoon when adding the cream and it worked out much better. No lumps. There was some crystallization on the sides of the pan, but once I poured it into another container it didn’t seem to affect the texture at all. I made this as a topping on a plain cheesecake for Thanksgiving dessert….it was outstanding! I did not use heavy cream, but substituted sweetened condensed milk, and the result was amazing. I will be using this recipe for years to come…with several of my favorite desserts. This sounds amazing! How much does it make? This turned out fantastic, vegan style. I used trader joes coconut cream & vanillabean paste instead of bourbon. Going to use it for a salted caramel layer cake! Amazing! I love how simple the indgredients are. This was my first time making carmel and EVER…..but it turned out perfect. Thanks! Fan-freaking-tastic! I’m sending this link to everyone I know who might be interested. Why would you buy caramel sauce in a jar when you can have this? Thnx for this great recipe! If i pour it into glass bottles and close/seal, how long will it stay good without refrigeration? Would love to mail as gifts! I think it’d be fine a week without refrigeration! I am allergic to corn, barley, Brewers yeast so whiskey and most any alcohol are not an option for me. What can I use?? I’m not familiar with what grains go in liquors, so I’d just suggest leaving it out! Or, as your local liquor retailer! Alcoholic beverages all start with yeast and sugar for the yeast…corn for bourbon, barley for scotch and sugar for rum (this you may get a way with, especially spiced rum [which I’ve made this with and it was WONDERFUL]). Brewers yeast has been manipulated to withstand higher alcohol content. Try making the caramel without the alcohol and drizzling a reduced mulled wine on top, if you can drink wine. Beer usually comes from malted barley and there are some fantastic seasonal specialty ones on the market that should do nicely incorporated into sugar and cream. You might use a flavor extract of your choice. Some of them are made without alcohol. I’ve been using this recipe with coconut cream and has always been awesome! But, I just made it better. Using coconut milk I added another can and made a salted caramel ice cream! Heaven! Is the coconut cream that you use the separated cream that you find in the coconut milk can, or is it a product labeled as coconut cream? I’m also trying this one with coconut instead of dairy milk – I tried coconut cream, but just over 1/2 c, and it made it too thin (which seems counterintuitive?). Would you say it needs more coconut cream or less? Ah, thanks for sharing our site, Kristyn! Great question on the recipe. Altering this to make it vegan definitely doesn’t provide the same effect, but similar. It will be a little bit thinner. But upon refrigerating it, it will thicken. Then just reheat for serving. I haven’t tried adding MORE coconut cream, but if you do, let me know if that helps! This looks amazing, what size containers would you suggest per recipe? I am thinking this would be great for my “cookie” exchange! First two batches crystallized due to (I’m guessing here) my heat not being quite at medium (for fear of burning it), and they also never reached a deep amber color. So, I gave it another shot only this time, I set the temp just at medium heat but also used Whole Foods Organic Pure Cane Sugar as opposed to the plain ‘ole extra fine granulated white sugar I used in the first two fails. Within 15 minutes I had the perfect shade of amber, stirred in some fresh heavy cream, a pinch of extra fine sea salt and 2 1/2 tbsp of Maker’s Mark (we love our bourbon in KY!). As soon as it cools, it’s going into a squeeze bottle for the apple crisp I’m going to be baking. Perfection. Thank you! I must be doing something wrong. It always comes out so thin and watery. Am i not getting it to the right color of amber, or is there an additional step to heating it up after the cream and bourbon? I may be searching in vain, but I was wondering if it possible to make caramel sauce using something other than granulated sugar? Yay! Glad you enjoyed it, Laura!! NB I made it today as per the instructions (except I used scotch whiskey instead of bourbon) and it turned out beautifully! I had to act quickly when I stirred in the cream though because it started bubbling like crazy, and the steam it let off nearly burned my hand! It was an exciting recipe to make! I used the caramel sauce on your mini cheesecakes which are still setting in the freezer, so I don’t know yet what deliciousness awaits me! That being said, I can imagine the outcome from all of my mini taste tests along the way :) Thanks for your great and simple recipes! I made this a couple of months ago and the sugar crystallized and the cream curdled a bit, but it was still salvageable and delicious over ice cream. It didn’t last long in the fridge — not because it went bad but because I enjoyed it so much I used it up quickly. Now that I’ve read the comments I see the mistakes I made, so I am going to try this again and hopefully fix the texture issues that I had. Thanks for such a wonderful recipe. I am going to try this for a Derby party (with pecans, cranberries and apple pieces, poured over a round of brie cheese). Yuuumm, looks delicious! Looking forward to trying this subbing almond milk! Turned out wonderfully…made it to top some mini cheesecakes and it was a hit. Making more tonight to make caramel popcorn. Thank you so much for this! I’ve tried this twice and have failed miserably :( I’m not sure what I did wrong because I’ve been able to do other caramel sauces. Bummer! I tried this with whole milk and xylitol (diabetic-friendly) and the consistency is quite thin. The liquid turned a slight shade of amber, but it’s definitely not as dark as the photo. Quite runny at the moment–will have to incorporate into a banana pudding. Heavenly… caramel makes everyThing Better:);) thank You so. Much for sharing!!! I made 3 batches of this tonight with a can of full-fat coconut milk, and it was so easy and delicious! *****Let the sugar dissolve in the water a bit before turning on the heat, and be sure to swirl the pan occasionally (just lift the pan slightly off the burner and “slosh” the caramel by shaking the handle gently)–these steps, along with keeping the heat at an even medium, will keep the sugar from crystallizing. *****Also, stir the milk in FAST–otherwise you will get chunks! Did you try pouring it into coffee? Mine did not work at all. I read all the instructions and comments before beginning. I had the same issue as another poster, my sugar never darkened. I kept it at a near boil, with little bubbles for 25 minutes. I eventually figured it must have it to low so I turned it up, but just a bit, and it crystallized. Too bad, I really wanted this to work. Lindsay, so bizarre! I just made my third batch of this and didn’t have any issues. Did you use white granulated sugar? It’s best. Also, did you stir? That can ruin the process. It shouldn’t be taking more than 20 minutes. Just to confirm you’re using 1 cup of sugar and 1/4 cup water? Hey Lindsay! Letting the sugar dissolve in the water (use a granulated sugar with small grain) before turning on the heat will keep it from crystallizing. Also, keep the heat at medium once you turn it on and “swirl” the pan occasionally. I think I figured out the issue! I did 2 batches with a nonstick pan and it boiled for all of time and finally crystalized and turned into a rock. When I used a stainless steel pan on the 3rd try-caramelization! Can these be made with something like coconut cream instead of the heavy cream…food allergies to milk. Yes! Sub coconut cream for the whipping cream, only up it a little more as it doesn’t give off the same level of creaminess that whipping cream does. Hope that helps! I simmered this for over 30 minutes and was the getting the deep amber color. Should it come to a boil or not. Tried bringing to a boil and started to crystallized. What am I doing wrong? Dorrie, keep it on medium heat. It should be lightly bubbling, not boiling. Once you get that deep amber color remove from heat and add the cream and bourbon. Hope that helps! This recipe is perfect!! I used 2% milk instead of heavy cream and had equally fantastic results. I waited for the caramel to cool and cracked in some pink sea salt. I used Maker’s Mark, maybe a little heavy handedly, and it has a nice kick-finish. Thanks for such a great recipe!! I also had results with the sugar clumping when I added the milk, perhaps not stirring vigorously enough as I added the milk, or maybe it was because I used 2%. I put the pot back over low heat and continued to stir until smooth. I ended up pouring it over a small sieve when I put it in the storage container and just had a couple pea-sized crystallized sugar pieces. Other than that — perfect! I made this with almond milk instead of cream. I don’t know how the texture will be when it cools, but I put a little bit in some cider before it cooled and HOLY MOTHER OF AUTUMN WAS IT GOOD. Served this with pumpkin break pudding for Thanksgiving. It’s AMAZING and I’m thankful there are leftovers. I keep sneaking spoonfuls from the fridge. Followed the recipe as written with a heavy pour of Bourbon. OMG I died and have gone to heaven. I could have eaten the entire batch in one sitting!!! It was so easy to make. I used Makers Mark. I don’t know bourbons very well, but MM worked nicely!! I’ll be making this for Christmas gifts!!! I made this. It was unreal. It was heaven. It was so easy. It was out of this world good. Hi, how long will the sauce keep in the fridge? A LONG time. I had mine for a couple months and it did great! Want to make this with Irish Whiskey for St. Paddy’s tomorrow. Can I double it? That sundae would tempt a saint! Looks delicious and the picture is perfect! I love caramel sauce and this sounds fabulous! Bourbon is so delicious in sweets. I look forward to trying this. My boyfriend is gluten-free and says he can’t have bourbon because it’s not. Thoughts? Based on my research bourbon is gluten free. However, if you’re still hesitant simply leave the bourbon out of the caramel sauce. Unless it says gluten-free on the bottle, bourbon is not gluten free. HOWEVER if you have Celiac/sensitivity, most who have bourbon are okay and have no adverse gluten reaction. That sauce looks amazing and will be on my dessert for dinner on saturday! Thanks for your post on A Cup of Jo! I am glad to have found your website. I am wondering: how long does the sauce keep? Could I make it as a gift for a friend? The sauce keeps for so long, that’s the best part! I’ve literally had it in my fridge for close to 3 months now and it’s still so fresh and delicious! You could absolutely gift this to a friend. I would just recommend having her put it in the fridge as soon as she opens it. Hope that helps! I havent tried but its got cream in it and that Martha Stewart thing says it will only last for 1 week. saw this on cup of jo and drooled! Ohhhh baby. I saw this post on Cup of Joe and had to come and take a look at your site – this looks absolutely spectacular! Could you substitute coconut cream instead of the heavy cream to make this vegan? It’s worth a shot, but I can’t guarantee it won’t give a curdling effect. I did try soy creamer once and it worked fine, though the flavor is much different. Hope that helps! I just used the full fat coconut milk in the can from Trader Joes and its perfect and DELICIOUS! No curdling at all. Fabulous recipe! Just found your stuff and Im loving it! Making the cheesecakes as we speak. Im vegan and GF so Im really excited to try these. Thank you! Hello! I just used coconut milk as well, but I’m not sure it worked. I’m always confused as to which part of the milk to use…the creamy fat at the top, the liquid underneath, or does that get mixed together before using? Thanks! Just use the creamy part at the top! You guys read my mind! Can’t wait to try this with coconut milk on vegan cheesecake!!! Thanks for commenting. I’m going to try it your way. Hi I just made this with full fat coconut milk but the color of my sauce is not dark amber it’s more thick white. I swirled pan didn’t stir and it was on the fire 17 minutes not becoming amber and didn’t want it to burn….any ideas what could be wrong? How did the dates work out? You need to let it caramelize and turn brown before adding the cocnut milk. Is that where you went wrong? My favorite sundae is vanilla, toasted coconut, and a heavy drizzle of salted caramel sauce. 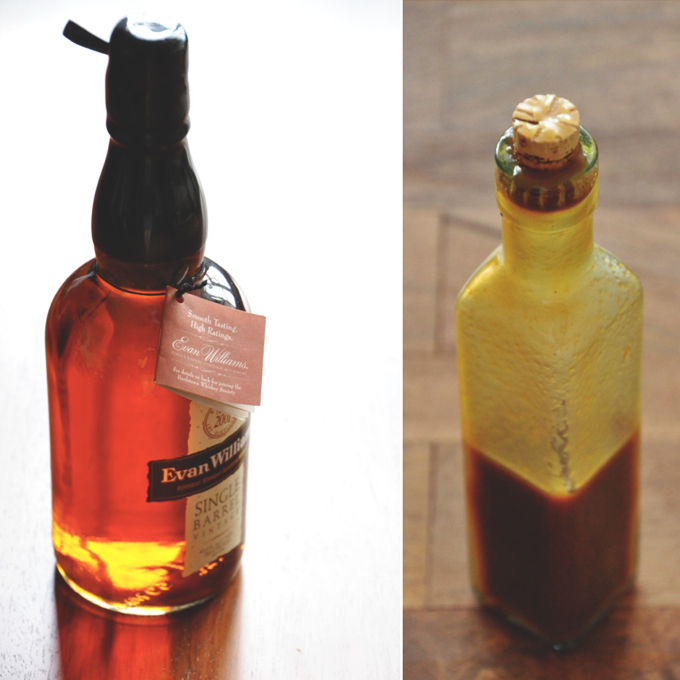 I love making rum-caramel sauce or bourbon-caramel & yours looks so good!